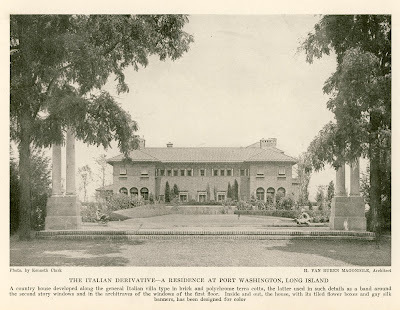 'Villa Corola', the Isaac Guggenheim estate designed by Howard van Buren Magonigle c. 1916 in Sands Point. Warren & Wetmore were responsible for the outbuildings and Ferruccio Vitale designed the lawns, gardens, pool terrace and driveway. Guggenheim was a member of Guggenheim Brothers, a mining and smelting holding company, as well as a director of the American Smelting and Refining Co.. Following Isaac's death the estate went to his brother Solomon (founder of the Guggenheim Museum in NYC). It later become a training center for IBM and is today the Village Club of Sands Point. Click HERE to see 'Villa Carola' on google earth. Picture from American Homes of Today, 1924. Handsome, exotic, not exceptional but very attractive. Very nice image of this home of a bygone era. I am so glad it is still standing and used. i went to bing to get a good look. beautiful interior courtyard and even more impressive from different angles. can we get pix of the interior sometime? I work inside the Mansion. It is more beautiful than it looks.